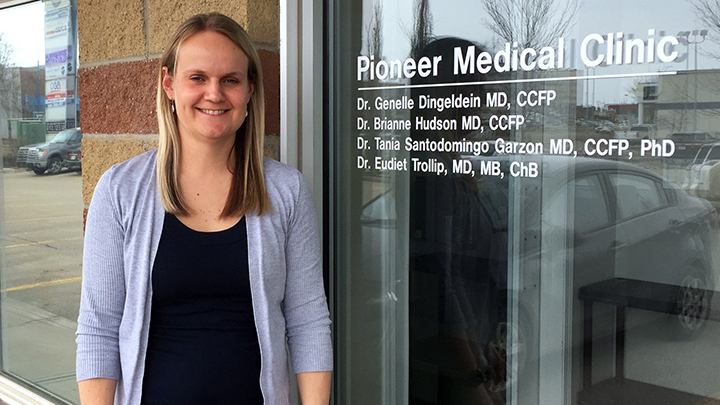 Dr. Brianne Hudson says The Community Paramedic Program, introduced to Grande Prairie this spring, can save trips to the emergency department as well as free up hospital beds. GRANDE PRAIRIE — Some days feel worse than others for 79-year-old Audrey Merlo, who lives with a chronic condition and is prone to infections. But one of the worst one in memory came in early April when she didn’t feel well enough to make it to either her doctor or the emergency department. Naturally, her family grew worried. “Our daughter Laura just happened to have a doctor’s appointment for herself that same day and offered it to me, but I told her ‘no, I can’t get out of the house to get there,’” says Audrey, who lives with her husband, Licio (Lee) about 10 minutes outside of Grande Prairie. So, at her appointment later that day, Laura raised her concerns about her mother with Dr. Brianne Hudson, who is also Audrey’s physician. Dr. Hudson called AHS Emergency Medical Services (EMS) and connected with the Community Paramedic Program, which recently launched here to improve access to medical care for seniors and vulnerable people who don’t always need to go to hospital, or who cannot be taken there. That same day, within hours, AHS Community Paramedic John Rogers showed up at Audrey’s house. 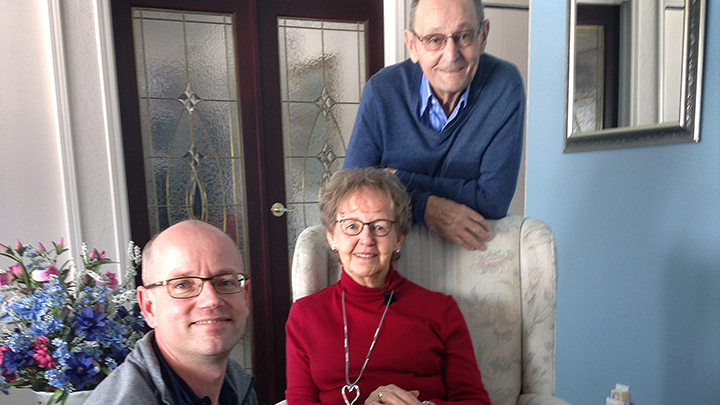 Audrey and Licio (Lee) Merlo pay thanks to AHS Community Paramedic John Rogers, left, after he came to help Audrey in her home near Grande Prairie. The Community Paramedic Program improves access to medical care for seniors and vulnerable people who do not always need to go, or who cannot be taken to hospital. Before Rogers arrived, he took a moment to review her medical history and her physician’s recommendations, based on what was known about current condition. While still at Audrey’s home, Rogers called Dr. Hudson to consult and give an update on her condition. He then wrote two prescriptions for medication, as per Dr. Hudson’s advice. Audrey and her husband say they’re both thankful for the home visit. “That same afternoon I was already feeling better,” says Audrey. “There needs to be more people like John,” adds Audrey. In all, there are four Community Paramedics based in Grande Prairie. The program runs 6 a.m. to 6 p.m., seven days a week. AHS expanded the program, initially established in Edmonton and Calgary, to more communities across the province at the end of March. “I think the biggest value in the program is being able to treat people in their homes instead of taking them to the hospital,” says Rogers. “The focus is on providing treatments that take longer periods of time, as opposed to ground ambulances, where the focus is more short term and getting the patient to the hospital as quickly possible. The Community Paramedic program is just one of EMS’ commitments to provide appropriate care in an appropriate setting. For more information, please visit www.ahs.ca.